The highly-anticipated UFC 229 event on October 6 is starting to take shape, with five bouts announced Thursday for the card at T-Mobile Arena in Las Vegas, which is headlined by the UFC lightweight title fight between Khabib Nurmagomedov and Conor McGregor. Tickets for UFC 229 go on sale on Friday, August 17. In the flyweight division, two contenders will battle for position in the race to take on new champion Henry Cejudo, as No. 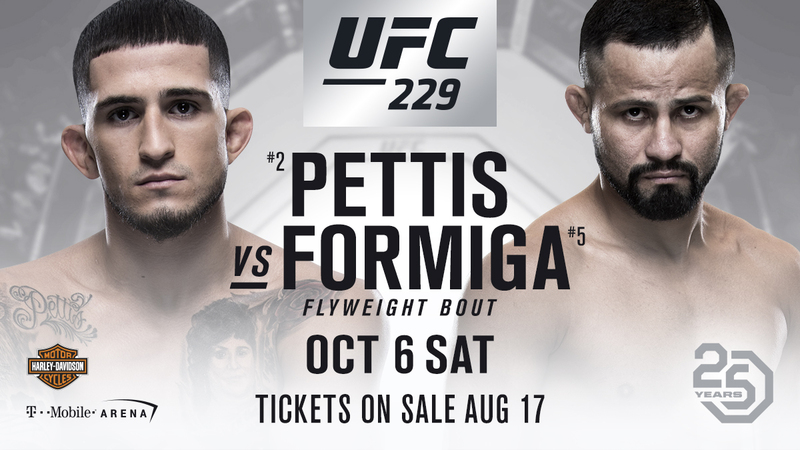 2-ranked Sergio Pettis faces No. 5-ranked Jussier Formiga. There will be plenty on the line in the strawweight division as well on October 6, as No. 7-ranked Michelle Waterson squares off with No. 8-ranked Felice Herrig. At 205 pounds, unbeaten Dominick Reyes will attempt to crash when the No. 12-ranked Californian takes on No. 7-ranked Ovince Saint Preux. Plus, Ryan LaFlare meets Tony Martin in a clash of welterweight veterans, and Lina Lansberg battles Yana Kunitskaya in a women's bantamweight bout.